Looking to rent an exceptional 45 Foot Scissor Lift in Rochester, Ithaca and Upsate NY? The Duke Company rents the highly regarded MEC 4555SE electric scissor lift and aerial work platform. 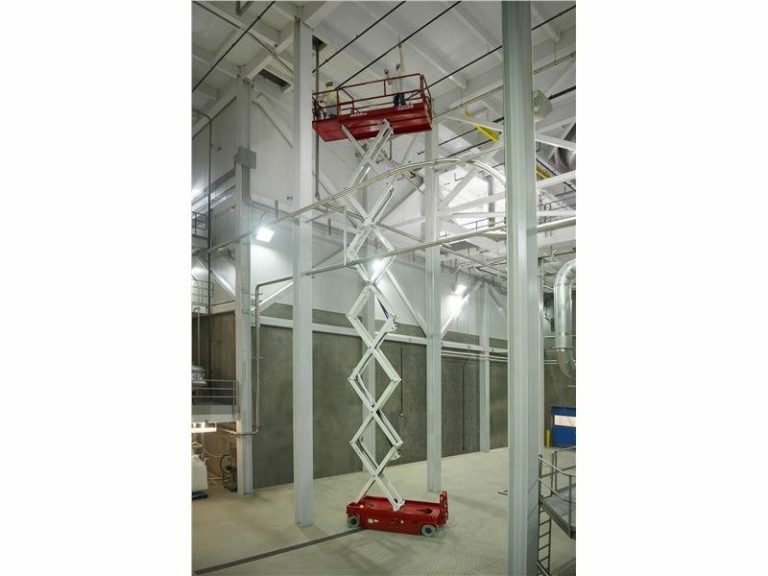 The MEC 4555SE has a working height of 51 feet, and long, 58 inch platform floor. With a travel speed of 2.5 mph (stowed) and 500 pound capacity, your crew will be extremely productive. The MEC 4555SE is equipped with a superior features including direct electric drive, emergency shut-off at power form and lower controls, fold-down guardrails, fork lift pockets, lanyard attachments, machine tie downs and non-marking tires. Travel Speed: 2.5 mph stowed and .5 mph raised. Capacity: 500 pounds lift and 250 pounds for the roll-out deck.